With any new products, there can sometimes be a few surprises. 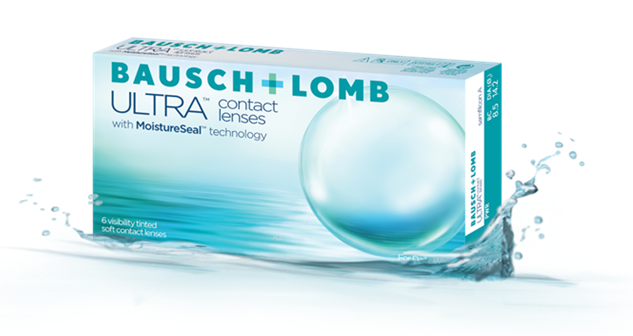 If you read my post about Bausch and Lomb's new monthly Ultra contact lens, you know that I found it exceedingly comfortable and a very exciting new option on the market. The overwhelming response to their launch of Ultra has been positive, with most patients reporting better initial comfort and less end of day dryness compared to other monthly lens options. But as more doctors began fitting the lens around the country, a surprising finding began showing up in a minority of lens wearers: redness. There are no official reports that have been published, but based on anecdotal evidence, within 2-3 days of lens wear some patients were experiencing redness around the cornea (or limbal hyperemia in its technical term). This redness typically had no associated pain, discomfort, dryness, or vision change. The eyes were just a little red. Within a day or two, the redness would be entirely gone in most patients, even if they had not discontinued lens wear. I have spoken with representatives for Bausch and Lomb, and they suggest that redness complaints should be handled on a cases by case basis, as any patient may have issues adjusting to a new lens material. The Ultra silicone hydrogel polymer is extremely oxygen transmissable (163 dk/t in a -3.00D lens), so breathability issues seem an unlikely culprit. They suggest that if your patient experiences any pain, discomfort, or vision changes, to of course discontinue the lens immediately, and contact your office. But if they are having no other symptoms, I was told by the Bausch and Lomb representative that the patient may continue to wear the contact lenses and in many reported cases, the redness resolved in a day or two without any complications. Of course, they recommend that if the redness persists or other symptoms develop, the patient should come back in to be seen immediately. As with any new contact lens being prescribed for a patient, a 2-3 week follow-up for all new fits is often a good way to check for any problems that may arise with lens wear. As a personal experience, I did not experience any limbal hyperemia on my first day of lens wear, but I did find that my eyes were slightly injected at the end of my second day of lens wear. I removed the lenses for bed, and woke up with clear eyes again in the morning. I thought nothing of it because I am solely a daily contact lens wearer at this time, and even if this is the best monthly contact lens in the world, it can never deliver what a daily contact lens can. As a precaution I did not wear lenses on day 3, and I experienced no discomfort or symptoms. On day 4 I wore the lenses again, and this time no redness at end of day. Of course, this is all anecdotal, but it may be true that your eyes just need time to adjust, and the redness your patient may experience could potentially resolve without any further issue. While Bausch and Lomb has no official comment on what may be causing this redness in some patients, there are a number of possible theories being floated by ODs. The lens is a 8.5 base curve, and many doctors theorize that the lens may be tightening up as certain patients wear the lens through the course of the day. If this is the case, and a tight lens syndrome was developing, then discomfort and vision issues would be expected to develop, and the lens would need to be refit for patient safety. The fact that the redness in many reported cases resolves without other symptoms may make tight lens syndrome less likely, but it should always be ruled out in patients by a discussion of symptoms, and careful evaluation of the movement of the lens on the eye. Other possible culprits reported include a possible solution interaction. There have been several case reports that show that a minority of patients may experience comfort issues when pairing Acuvue products with Opti-Free Replenish or Express solutions. Since Bausch and Lomb Ultra was designed with a similar lens shape and edge design as Acuvue Oasys (and by the same person), it may be that this lens also has interaction issues with certain lens solutions. There are no official staining grid reports since this lens is so new, but Bausch and Lomb does suggest pairing their lens with Biotrue, or their new PeroxiClear hydrogen peroxide solution. In the FDA trials performed by the company to bring this lens to market, these solutions were used with good success. As a personal aside, I was using PeroxiClear with my lenses and still experienced day 2 hyperemia, but it did resolve quite quickly the next morning after the lenses were removed overnight. So what do these reports of redness with the Ultra lens mean to you? I still think that this lens could be a great option for patients that are experiencing dryness and end of day comfort issues with other monthly lens options, but aren't ready to jump into daily contact lenses due to price. The Ultra is also ideal for refitting those Acuvue lens overwearers that are trying to get a month out of a 2 week product -- the edge profile of the lens is almost identical to Oasys, making for the easiest transition to monthly lens products that I have had in my office. I have been very careful as to the K values that I have fit this lens on, and to this point have only had myself experience redness, and none of my patients. I have proactively instructed my patients to call me if redness or other symptoms develop, but have not heard from anyone. I have also been following Bausch and Lomb's advice to recommend Biotrue or hydrogen peroxide solutions with this lens, just in case it is a solution interaction issue in sensitive patients. If fit with a proactive attention to detail, I think that you will have the same success in transitioning patients to this new, very comfortable and highly breathable lens material. Have you had issues with hyperemia after wearing Ultra for a few days, or have a theory of your own why this side effect is showing up in doctor's anecdotal discussion of the lens? I would love to hear more input as to other people's experience with this lens, whether you are a prescribing doctor, or a patient that is trying it out for the first time! UPDATE: I was at a meeting last night, and a culprit for the redness complaints has been found! Issues were isolated to a single manufacturing plant, where they found that too much NaCl (salt) was being used in lens manufacture. That increased salinity created redness when the lens was put on hte eye. Bausch and Lomb has remedied this problem and moving forward does not expect any continued redness issues. Disclaimer: I am not a Bausch and Lomb employee, or in any way affiliated with their company except that I have worn their lens and am fitting it for my patients with good success. The conversation provided in the post above is all anecdotal and I have performed no actual studies on the lens myself and would not consider myself qualified to do so. To this point, there are no official reports as to how many people experience redness with the lens (we know it is a minority, but we do not have a percentage) and there is no official statement from the company concerning the most likely cause for hyperemia reports in these patients other than these situations should be investigated by the doctor on an individual basis. I do not wear a prescription, but I threw on a -0.50 Ultra OD & a -0.50 Biofinity 8.6 OS just to try for the day. The Ultra was by far more comfortable (and we fit a lot of Cooper at my office), but after 8 hours, I noticed the limbal hyperemia in the Ultra eye. But no discomfort at all. Since I don't wear lenses, I didn't give it a second or third day. I'm going to do a 3-day run again and see what happens this time. Please keep me updated with your findings! I look forward to hearing more about your experience. I really don't know what to make of the hyperemia issue -- I have not had a single one of my own patients return with this complaint. Everything I have heard about this issue has been anecdotal, and apparently very infrequent. I would not consider it a major issue in fitting this lens based on what I have seen so far. As far as comparing this lens to Biofinity, I think it really depends on the patient. If someone was having issues with comfort or dryness in Biofinity, and the Ultra lens curvature fit that person's eye appropriately, it could offer the patient an alternative to changing to 2 week or daily modalities for better comfort. Which lens I would chose really depends on the person's complaints, their eye shape, and the way the contact lens fits and moves on the eye. I had severe redness issues with ultra, pain and had to remove them after day one. Never had this issue with any other contact. Going to give it a year and try again because I would love longer lasting contacts but my trial run went horribly. I usually wear biofinity and have never had a problem with them. A few months ago my doctor switched me to ultra and I have had the most discomfort I have ever had in eyes with this brand. In both eyes the lenses are uncomfortable but in one specific eye it gets red- the longer I wear them the refer it gets and the more it hurts. Both eyes get red but just one is irritated more. The one that gets the worse status blood shot red for 2 to 3 days after wear in addition to the pain and puffiness it also gets extra gunk in it that I would normally get. I have had nothing but a bad experience with this lenses and would not suggest it to other people. Thank you for posting this!! I'm about to contact my eye doctor because I too am having red eyes and stinging/burning with these contacts. I've tried them for a week and even changed cleaner solutions hoping it was just a reaction between the two. I had high hopes for these contacts because I work on a computer all day, and I really do seem to have clearer vision with these contacts (previous contacts were Accuvue Oasys). But that's only when I can keep my eyes open!! Thankfully I haven't actually purchased any and have just worn my trial pair. I've used B&L Pure Vision for several years and have worn contact lenses for over 30 years, mostly B&L soflens until prescribed the Pure Vision. I switched doctors and was given an Ultra pair to try and while they were extremely comfortable all day yesterday, by end of day (wore them for 10 hours), noticed my eyes were reddish. When I took them out (no pain experienced), was surprised by the redness which I've never experienced with all the years I've used contacts. I found this article and comments and will help me when talking to my new doctor on this experience. Maybe I received a sample from one of the lots that had too much salt. Pure Vision has been great, and I did find the Ultra even more comfortable, but the hyperemia did cause concern. If we find I stay with the Pure Vision, that's OK as they've worked well. Nice to know what may have happened with the trial. I have never had a worse experience with contacts. After the first day of wearing them both eyes were blood shot. When I went to remove them, my eyes were in such pain that I had to make sure to touch only the contact. Any contact whatsoever with my eye caused excruciating pain. When I woke up the next morning both eyes were still blood shot and I had an excessive amount of gunk in my eyes. Never again. This would be my first time wearing prescription contacts. I have worn eye color altering contacts. Having said that. 20 minutes after I had Bausch & Lomb Ultra my eyes where itchy, but I was willing to give it a try. The itching came and went so it was easy to forget. But at the end of the day my eyes were really red for 2 days. Same for me. Filing report. I have worn the Ultra lenses over the last two days, taking them out before bedtime. They felt fine on the first day, but I noticed some redness in one eye when I took them out. When I put them in again this morning, almost instantly both eyes went bloodshot. I was hoping it would calm down through the day, but it just got worse. My eyes were incredibly red and sore when I took the lenses out once I was home from work. I won’t be wearing them again!